Today I felt like a greedy little kid in our garden picking the vegetables for supper. Kale, of course. Tomatoes...sure! Green squash, oh wow! I didn't know those were ready yet! I'll take all of them please. I kept on thinking on the way home, "I can't believe the garden just GIVES you this stuff!" Our garden is a little neglected right now (it has taken second place to our cows, and man have they been keeping us busy! ), but even overrun with weeds, its still rockin. 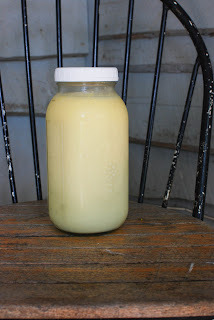 It made me think about how I've been wanting to tell you about colostrum. When a cow gives birth, her first milk is a thick yellow milk called colostrum. It's heavier than milk, so its not as drinkable and as I was googling what to make with it, I was amazed.
" Colostrum is the first milk of mammals. 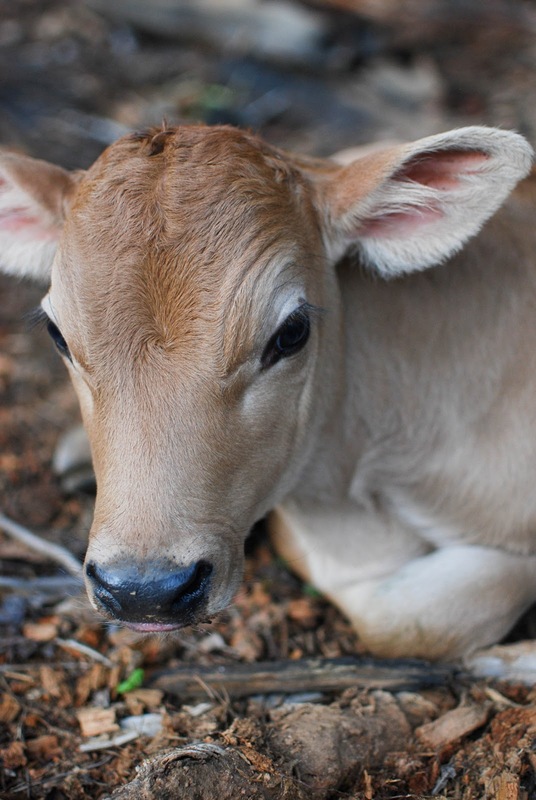 Like human colostrum, colostrum from cows is rich in immune factors, antimicrobial fatty acids, vitamins and minerals--all necessary to protect the calf from infection and insure adequate growth during infancy. Colostrum has a long history of use in the practice of medicine, especially in Ayurvedic medicine, and has been successfully used to treat a host of chronic diseases including allergies, autoimmune diseases, respiratory ailments, digestive disorders, diabetes, osteoporosis, heart disease, gout and depression. In fact, colostrum is said to be the perfect anti-aging food and has been used in expensive spas for years. 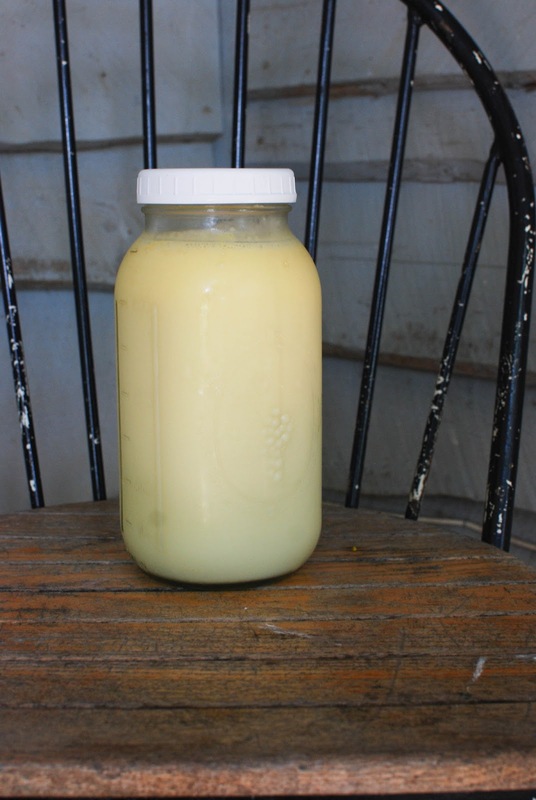 A friend of mine from Turkey recounts that her mother always obtained colostrum in the spring--often at great trouble and expense--from a farmer in the countryside. She then lined up all the children and gave them a cupful of this tonic to drink. The immediate result, says my friend, was that they all fell asleep. 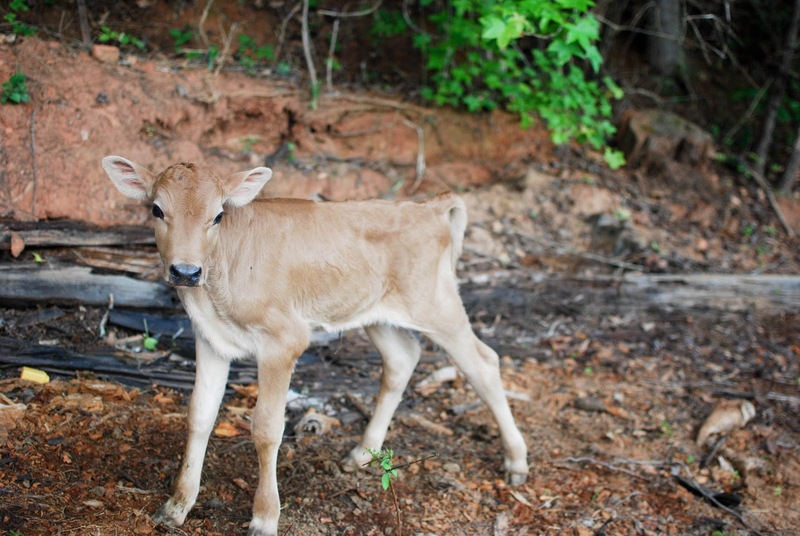 The colostrum was said to help keep them healthy throughout the year." Isn't that amazing? The cows just GIVE YOU THIS STUFF! I have two gallons frozen for when the next family member gets sick. I can tell you that I was suffering from some digestive issues that no longer occur now that I've swallowed several cups of this stuff. We feel like kings having so much of this substance just sitting around. 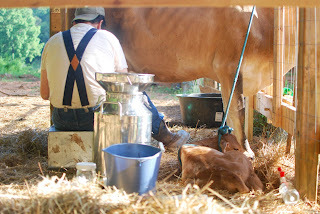 Now that Bonnie had her baby, we are getting between 3 and 4 gallons of milk a day. (We are keeping the babies with their mamas, so that is why its not double that). Here is a picture of the milking set up when Jason had to tie the babies close to their mamas, (so the mama's wouldn't get stressed out.) The big silver thing holds up to seven gallons of milk and the filter sits right on top of it. Jason milks for a while into the pail and then pours it into the filter which puts it into the "tank." 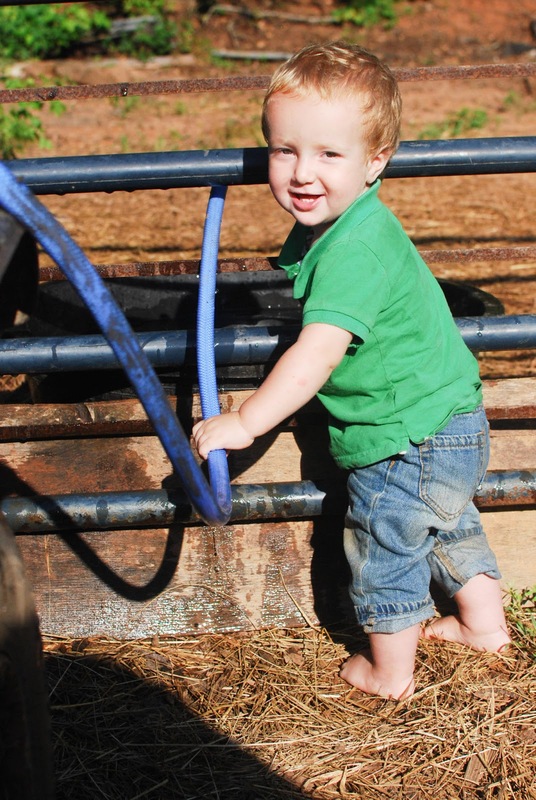 Farm chores start young around here! 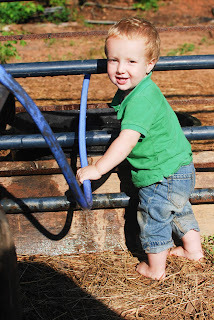 This is Peter, age 15 months, making sure the cows have enough water. 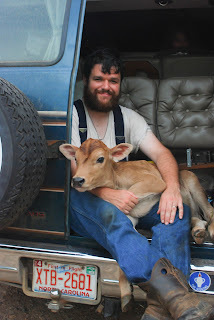 Peter LOVES the cows: petting them, feeding them, kissing the calves and even licking their salt lick with them. Now that the cows have had their babies they seem to be even more cautious around our little ones, almost like they understand now. Baby Levi, our bull calf. Aren't they just precious? He is really tame and Henry will go up to him and lay on top of him while he's sleeping. Henry likes him cause he is a boy. I mentioned earlier that our cows have been keeping us busy. They have been being REALLY stubborn about coming into the barn at night. They leave their babies in the pasture and then take their time coming up to get milked. Poor Jason has been out in the rain for hours each night trying to bring them in, and then finding their calves so we can lock them up in the barn. On nights when we can't find the calves, we can't lock them up, and then Jason has to spend an hour or so in the morning finding the cows and then bribing them up to the barn. 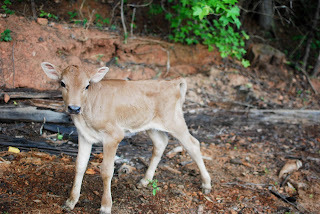 There have also been a lot of flash floods recently, so he has to make sure that the mama's bring their calves to the barn so they will be safe. They seem to be fine with our routine; they just like to take their sweet time. Jason's been exhausted, and I have had my hands full with the kids, but we both still love this. The kids eyes glow as they count the jars of milk Papa gets at each milking, and I admire my husbands persistence and patience even more then before. When a husband works from home, his wife and kids gets to see his work ethic, and I have never been more proud of my man. 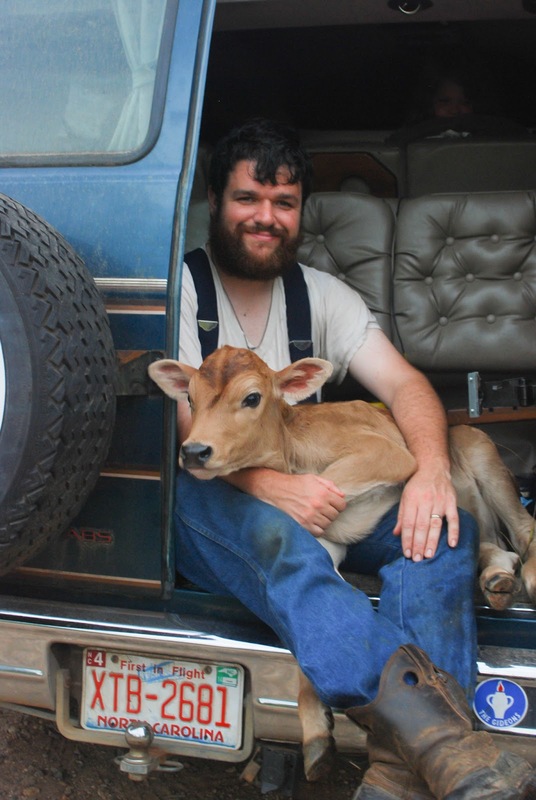 Below is a pic of Jason holding Baby Levi (or "baby Evi" as Henry calls him), in the back of our big van as we carry him up to the barn. These little calves are heavy!